Prepared using 8- inch flour tortillas, low fat Swiss cheese and no mustard. 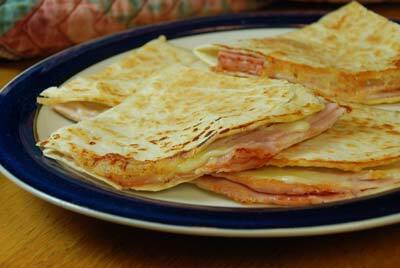 On half of each tortilla place 2 slices of ham and 2 slices of cheese. Trim slices and overlap if necessary, so ingredients cover only one half of the tortilla. Spread with mustard, if desired. Fold bottom half of tortilla over ham and cheese filling. On nonstick griddle or skillet, melt margarine. Cook each tortilla 4 to 5 minutes per side, turning once until ham is hot, cheese is melted and tortilla is golden brown. Cut tortillas into wedges and serve immediately.